There are two distinct modules to our system; the treatment module and the dosing module. The dosing module must have access to the ballast water system and will likely go in or near the pump room. It can be constructed with EX rated components and be installed in classi? ed areas when needed. The treatment module can be located almost any- where. We simply need to be able to run piping from the treatment module to the dosing equip- ment. In short, the entire system as a whole is very ? exible and modular. Also, each component is smaller, as compared to other systems. TM treatment game. The vessel’s Envirocleanse inTank BWTS hold time. 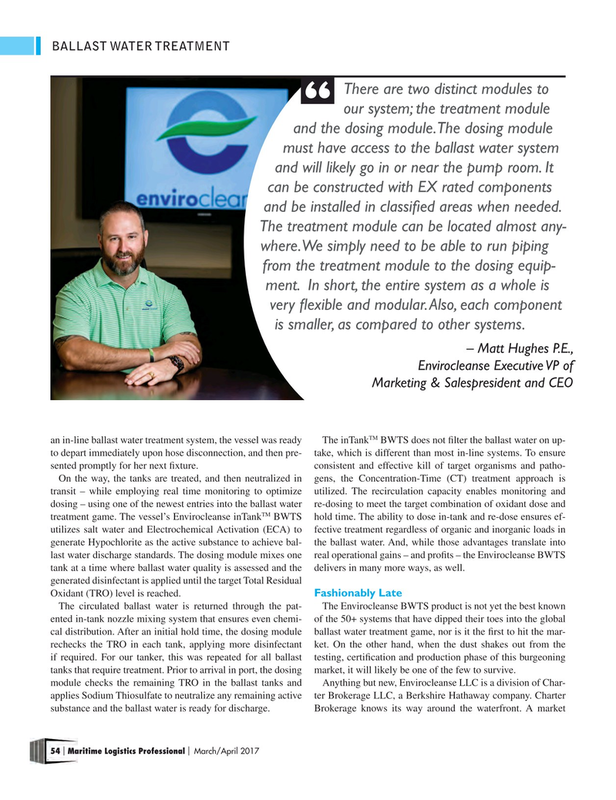 The ability to dose in-tank and re-dose ensures ef- utilizes salt water and Electrochemical Activation (ECA) to fective treatment regardless of organic and inorganic loads in generate Hypochlorite as the active substance to achieve bal- the ballast water. And, while those advantages translate into last water discharge standards. The dosing module mixes one real operational gains – and pro? ts – the Envirocleanse BWTS tank at a time where ballast water quality is assessed and the delivers in many more ways, as well. The circulated ballast water is returned through the pat- The Envirocleanse BWTS product is not yet the best known ented in-tank nozzle mixing system that ensures even chemi- of the 50+ systems that have dipped their toes into the global cal distribution. After an initial hold time, the dosing module ballast water treatment game, nor is it the ? rst to hit the mar- rechecks the TRO in each tank, applying more disinfectant ket. On the other hand, when the dust shakes out from the if required. For our tanker, this was repeated for all ballast testing, certi? cation and production phase of this burgeoning tanks that require treatment. Prior to arrival in port, the dosing market, it will likely be one of the few to survive.